Q: Is there an online MW I manual available ? A: Yes ! Thanks to Georg's work ! Q: Is there a WaveSlave manual online ? Q: Where to get the latest MW I OS ? Ask your local Waldorf distributer for details. Its an ROM chip update. Q: How to calibrate the filters? A: MW1 users who have a working unit: DON'T DO THE FOLLOWING!! To tune the filters, you have to go into the Service Mode. - Press Mode and switch on the MW. As soon as you can read "Welcome to.." release the Mode button. - Press OK to confirm the warning message. - With the Mode button, step through the pages until you read "Filter Test". - With OK you can toggle each of the eight filters on and off. - With the alpha dial, you can tune the filters. I think you should try 440 Hz, but if you can't reach it with one or more filters, try to find a close frequency and tune the other filters to that, too. - When you're done, switch the MW off and back on. Now the filters are tuned again. Again: all others shouldn't do that, **only** if they experience *major* tuning problems. Q: What cards do fit in the MW I card slot? A: You can use the original Waldorf MW I cards that were sold as ROM (read only) and RAM cards. Q: What batteries are inside the MW I RAM cards? You should be able to buy those in most electronic shops. Back up the contend BEFORE doing so. The slot cor the battery is on the small front age of the card (opposite of the contacts that will go into the MW I slot first). Pull the little plastic drawer that hold the empty battery. Memorize the way the drawer was in the card and the way the battery was inserted. Q: Can I hook a WaveSlave to a MW I running OS 2.00 ? A: Yes, you can do so. But the WaveSlave will react strange to those OS 2.00 features of the MW I driving it. Q: How to use a WaveSlave without a MW I ? A: This won't work at all. Q: How do I get my Microwave 1 to tell me what version ROM it has? Requests version number and date of the software. Power up while holding the Mode button, and release it as soon as the message "Welcome to the MicroWave" is shown. From this point on YOUR SOUNDS WILL BE DESTROYED ! Q: How to use the Service Mode on the MW I? don't try this unless you know what you are doing. You might loose all your sounds and data. And if you calibrate your filters wrong, you won't like your MicroWave I after this. You do this at your own risk!!! audio output. Voices 1-4 will be output at their respective single outs. Use Alpha dial to fine tume the frequency of this voice. Alpha dial covers +- 1 semitone. If unable to tune correctly, adjust coarse tuning of filter using pot on motherboard. Center Alpha dial first?. Q: What different microwave I versions are known? sonically they are nearly the same. The change of the filter didn't changed the microWave sound that much. And although the older version used the same Curtis filter chip as the big Waldorf WAVE, the sound is totally different. There is also a single microWave with a chrome front plate (and a spare front plate like this in the hands of an ex-Waldorf employee). And the 99 last microWaves build came named "the mean green machine" with a green front plate and some spikes to put the unit on the shelf. Also included was a document in the look of a contract. 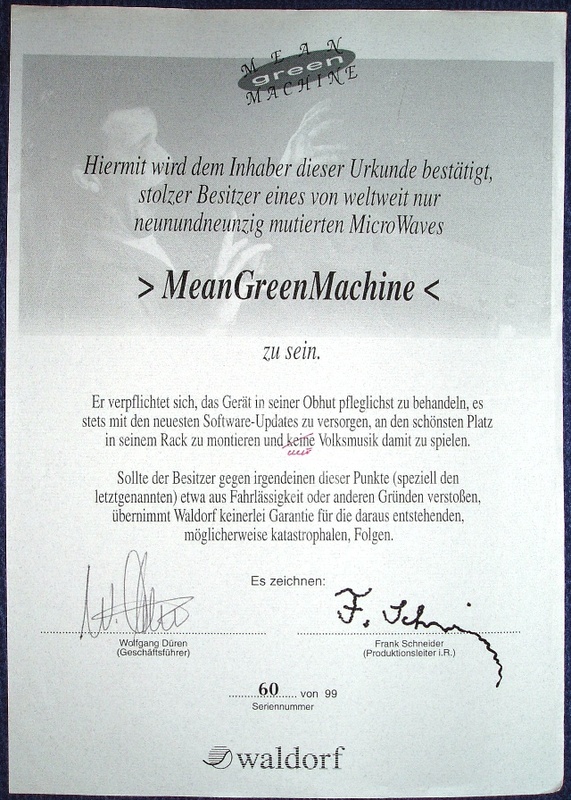 It said you are not allowed to play folk music and that you have to feed the mean green MW I with all available software upgrades. Q: How to check if my MW1 is running on the latest OS (=2.0)? Q: What were the new features of the MW1 OS 2.0 ? Q: What's inside a MW I ? A: Have look at the link below. Q: What's inside a WaveSlave ? Q: How to remote control the MW1 by an controller keyboard? A: Because of the MW1 nature, you have to send the parameters to edit a sound by means of SysEx. And this is one thing not all remote controllers are able to do. The Access MW1 controller did a good job. But not all parameters can be acessed by it. Only the most often found parameters on analog synths got their knob or button. The Novation Remote 25 is one option to go. Boele "SCD" Gerkes gave us his template SysEx (using all the knobs and buttons in 6 layers) and PDF description of what knob does what parameter. See the link below for the free download. Q: How to repair a non working big red encoder? A: Open the MW (unplug the mains!!!) and carefully open the encoder housing by gently bend the four metal brackets that hold it together a little bit. Once open, clean the encoder's inside. You may use Q-tips (not the Waldorf Q tips & tricks), and some alcohol to do so. Maybe greese the axis a little bit. Assemble everything together and gently bend the encoder metal brackets back in place. Shut the MW and you are done.